balanced work of shimmering bronze and hand-cut glass. The airiness of the minimalist design plays beautifully against the substantial materials that comprise it. 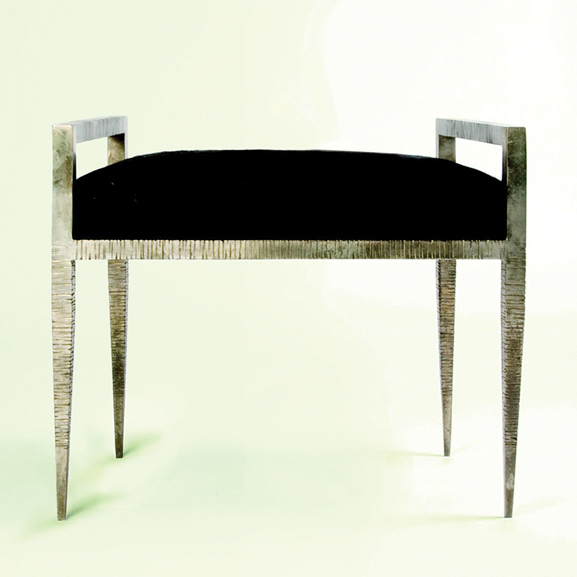 James Magni, the talent behind the exquisite piece, believes furniture is the ultimate fusion of architecture and sculpture. In that sense, Magni is truly in his element. He started art school wanting to be a sculptor, inspired in part by his Italian heritage. An astute instructor pointed out that Magni’s pieces were all utterly architectural and encouraged him to pursue architecture. He quickly rose to the top of his field; his subsequent design firm enjoyed comparable success and Magni was named one of Architectural Digest’s Top 100 Designers. consistently been recognized as an innovative and important voice not only in the design world, but also in the art world. Magni is clearly very knowledgeable about art, and his conversations are littered with references to artists of all kinds. “I see myself as blurring the line between fine art and fine furniture,” Magni says. Exquisite samples of MAGNI chairs. Images courtesy of MAGNI. Magni likens his Los Angeles production studio to a 20th-century artist collaborative in the manner of Andy Warhol. Together for fifteen years, all are artists in their own right, together creating a vibrant and intense creative environment. With this most recent collection, it seems clear that Magni will continue to be recognized as one of the most talented furniture designers in the business. With impeccable quality and a unique aesthetic sensibility, MAGNI Home Collection has certainly earned its place in the Robb Report’s Best of the Best.